Coconut chicken: Slice each chicken breast into 6 strips. Marinate the strips in the orange juice and refrigerate for 1 hour. Season the flour with the garlic and dried herbs. Whisk the eggs well with a little bit of water. Set out 3 containers, one each for the flour mixture, egg wash and coconut. Remove the chicken strips from the marinade. Dip each strip first in flour, then egg wash and finally roll it in the coconut. Arrange in a single layer on a baking tray and refrigerate for 1 hour. Deep-fry the chicken strips until golden brown and drain on paper towels. Mango sauce: Blitz all the ingredients in a food processor. Adjust seasoning by adding a little more sugar if the sauce is too sour or a squeeze of lime if it's too sweet. 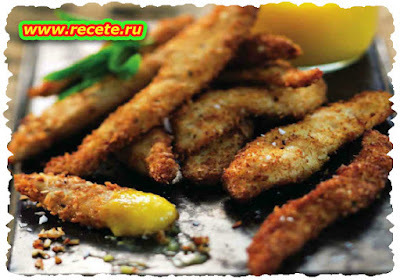 Sprinkle with extra chilli flakes and serve with the coconut chicken strips.